Hey, boys and girls, I’m so thrilled to welcome a new review by the brilliant, insightful and delightful Miss Dollie Banner. 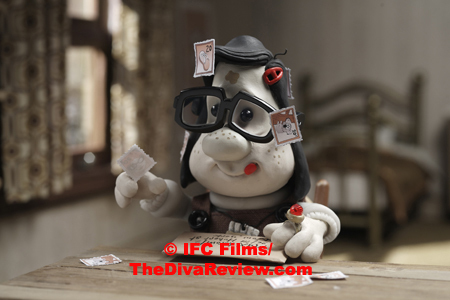 Read on for her thoughts on the animated feature, Mary and Max. It always disturbs me when a feature-length animated movie doesn't live up to expectations because I know just how much painstaking work goes into it, having studied animation myself. I could barely finish my one-minute film, so I truly appreciate the effort involved in crafting one that runs a full ninety-two minutes. 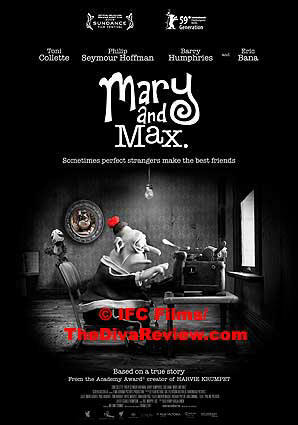 That's why Mary and Max is doubly disappointing; because all the love, care and meticulous work that went into it results in a movie that is not very fun to watch. 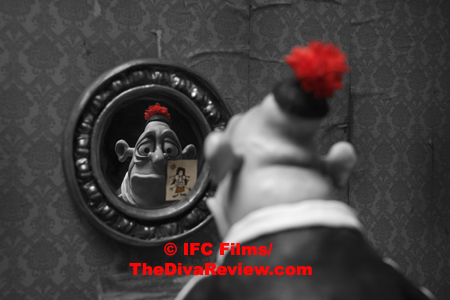 Mary and Max marks the first feature of animator Adam Elliot and producer Melanie Coombs, who took home the Oscar for best animated short for 2003’s Harvie Krumpet. 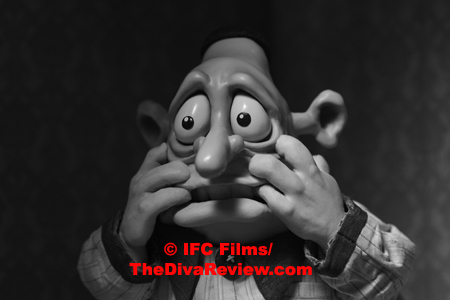 This film tells the story of two unlikely penpals through the medium of claymation stop-motion. 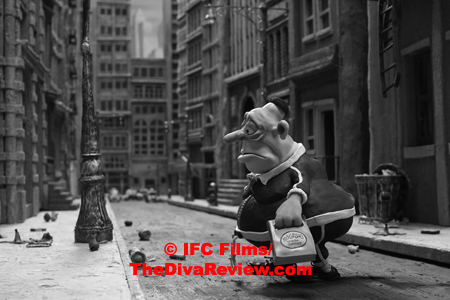 Mary, voiced by Bethanie Whitmore as a youngster and Toni Collette as adult, is a lonely, awkward child trying to cope with growing up as an outsider in the suburbs of Melbourne, Australia, who serendipitously chooses a likeminded correspondent in Max, a forty-something Jewish New Yorker, just as isolated in his city of millions. The two exchange letters, questions and goodies (- mostly of a chocolate variety) throughout Mary’s adolescence and early womanhood, ultimately becoming each other’s closest friend and confidant. It’s a promising premise, but the details of not only their lives, but their friendship are so dismal and disheartening that the films feels more like abuse than entertainment. Elliot obviously cares a great deal for his characters and the most successful aspect of the film is that the audience does too. He has lovingly handcrafted dozens of personal details to flesh out their two worlds. The problem is that those details are so relentlessly negative that it’s nearly impossible as a viewer to enjoy their story. Elliot’s visual style most closely resembles that of the Aardman Animation, responsible for the sublime Wallace and Gromit series, as well as Chicken Run, but lack the charm and wit that distinguish those films. I’m not saying that every animated movie has to be a feel-good story, but I personally don’t care to be punished for investing in the main characters. 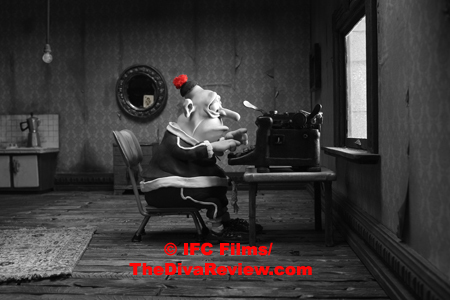 Even so, Mary and Max does boast a few things to recommend it. Firstly Barry Humphries, more commonly known as Dame Edna, provides the welcome narrative that sets the tone and guides the viewer skillfully through the ups and downs of the leads’ relationship. And Phillip Seymour Hoffman offers his nearly unrecognizable voice as Max, the type of character one runs into daily on the streets of New York, but almost never sees on the screen. Hoffman obviously took some time and skill to create a fully new character and his sequences detailing Max’s first few letters to Mary are the most enjoyable. Unfortunately, Mary matures far too late for Toni Collette to add much to the film. 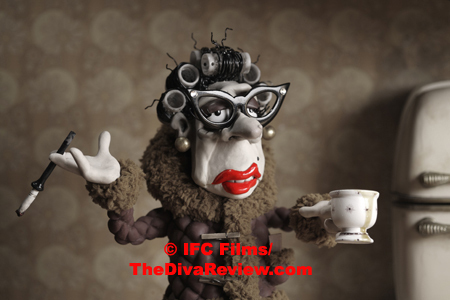 I wish some of her vocal enthusiasm had made their mark on the story, but ultimately Mary and Max is just not any fun at all.